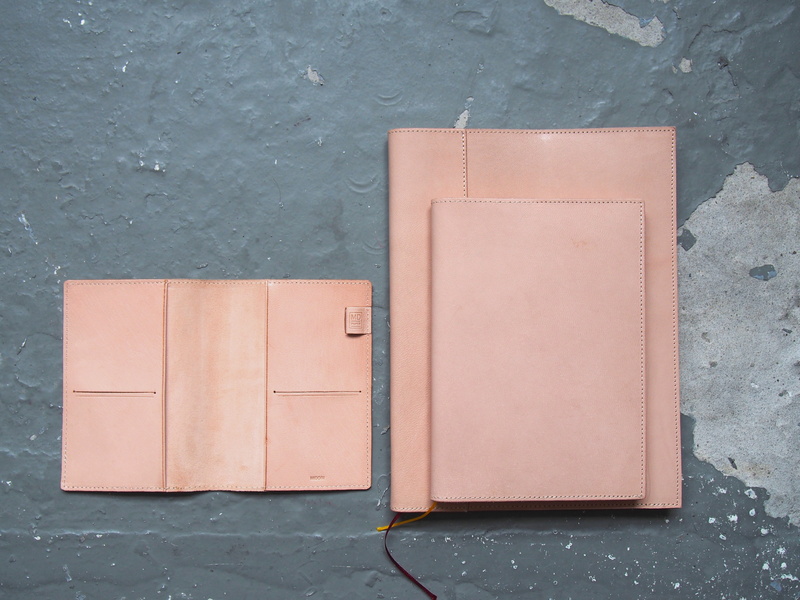 We just got in these leather covers made by Midori for their line up of MD Notebooks, and yup, you can say that I am in love. It took me a while to really get into the Midori Traveler’s Notebook, and I use both the Rhodia Webnotebook and Quo Vadis Habana fairly regularly, but that’s more of a utilitarian relationship. 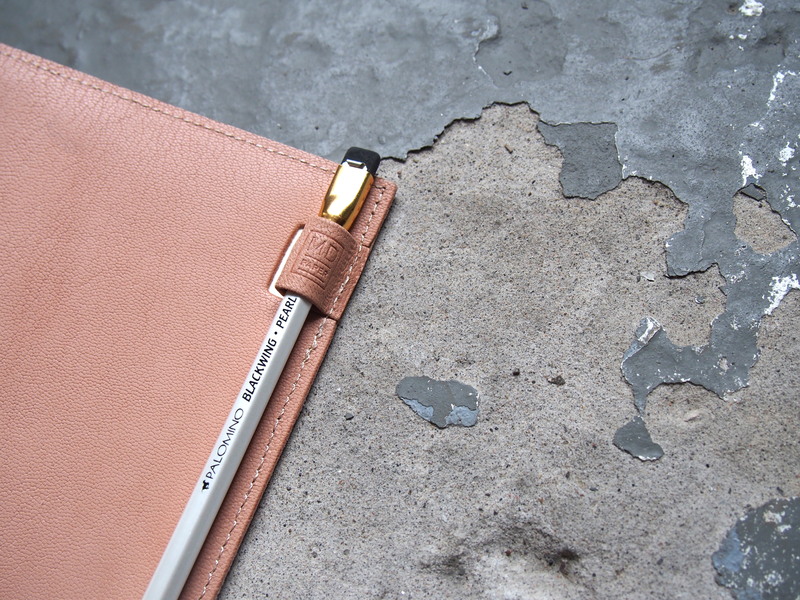 This MD Notebook + leather cover system is something that is truly timeless: love at first sight. 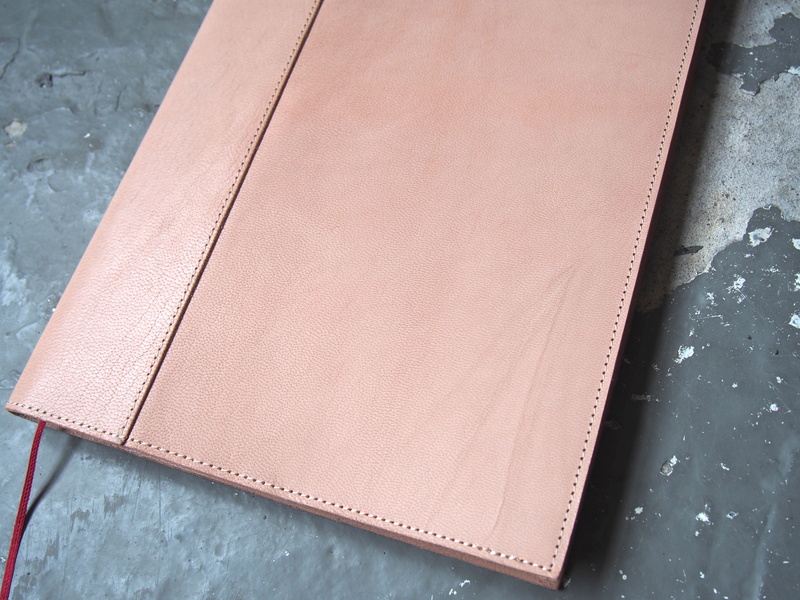 We’ve been asked quite a few times about a refillable leather notebook cover. There’s just that something about a leather cover that has been with you through thick and thin and in and out of bags and onto subways and into cafes and bears the marks of your living. Of course we have the refillable Midori Traveler’s Notebook system, which gives you additional customizations like zipper pockets and card slots to make into a wallet system or the functionality of holding multiple notebooks to organize different parts of your life. However, a lot of people have asked about something a bit more classic, just for journaling and writing, and this is it. 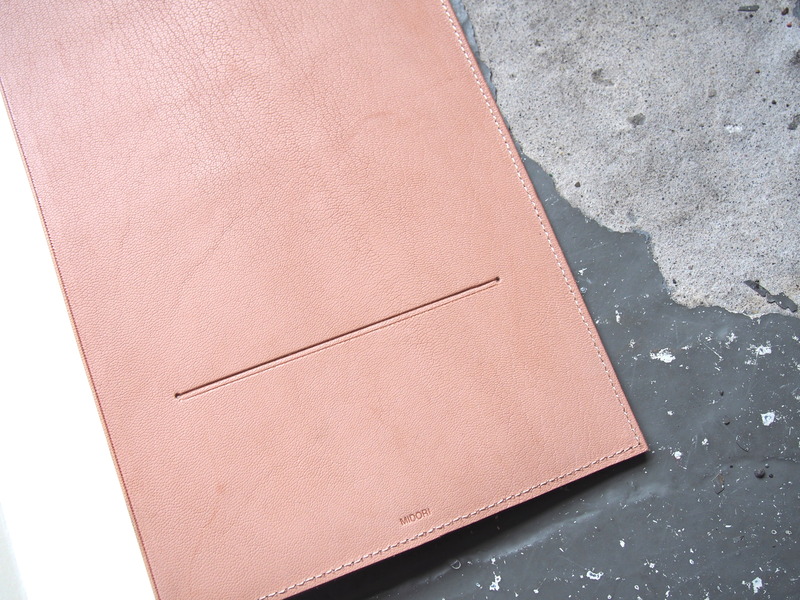 It’s a clean and simple and classic and timeless refillable leather notebook. And actually, what really sold me on the entire line of MD Notebooks in the first place is the fact that there is a leather cover to go along with the notebooks. 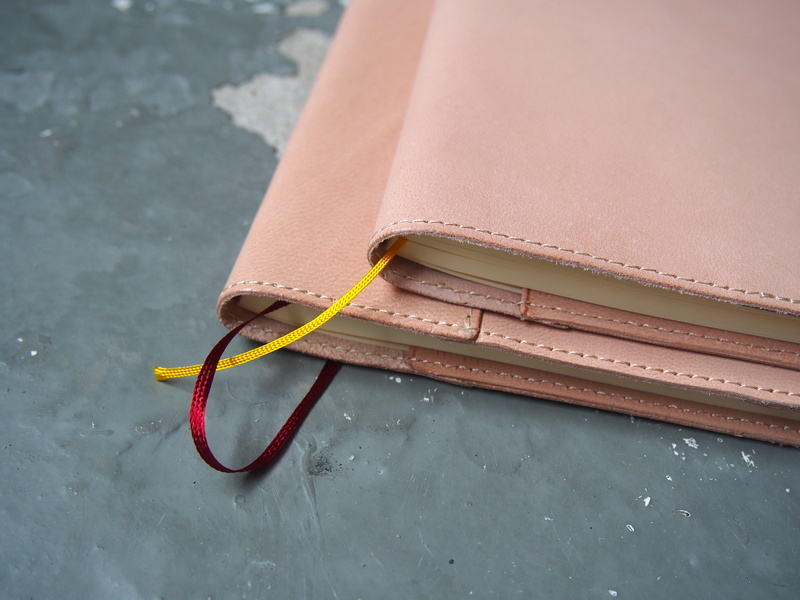 I love the entire line of MD Notebooks, the crisp white covers, the smooth, fountain pen friendly paper, the stitch binding, it goes on… but having a leather cover available made it impossible to say no to bringing in the line. It took a while to finally get in the leather covers from Japan – we got the A6 first, but had to wait for the A5 and A4 to show up – but they’re now all here. 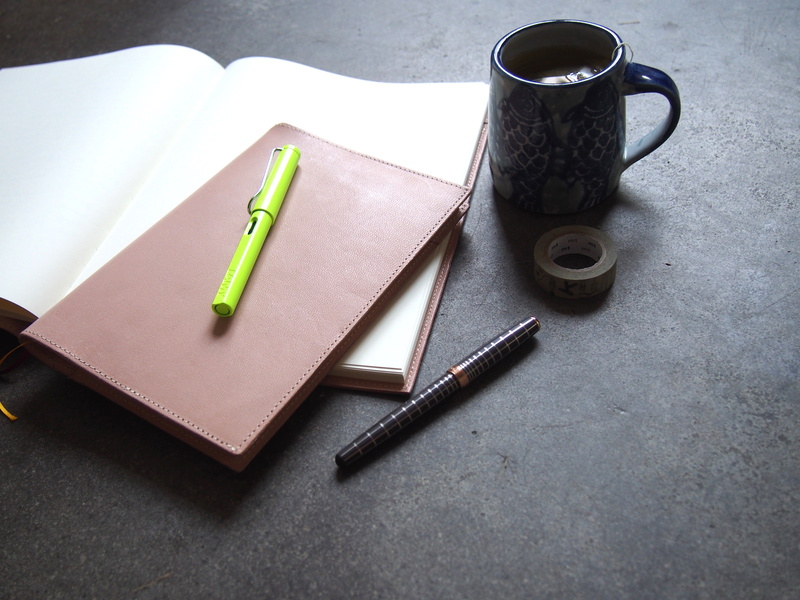 Of course if you’re going to invest in a leather notebook cover, you want to make sure that the paper refills it takes are great: after all, you’re committing to the leather and the paper. I did a blog post showing the paper with different inks on it here, and there a few close-ups of the writing. 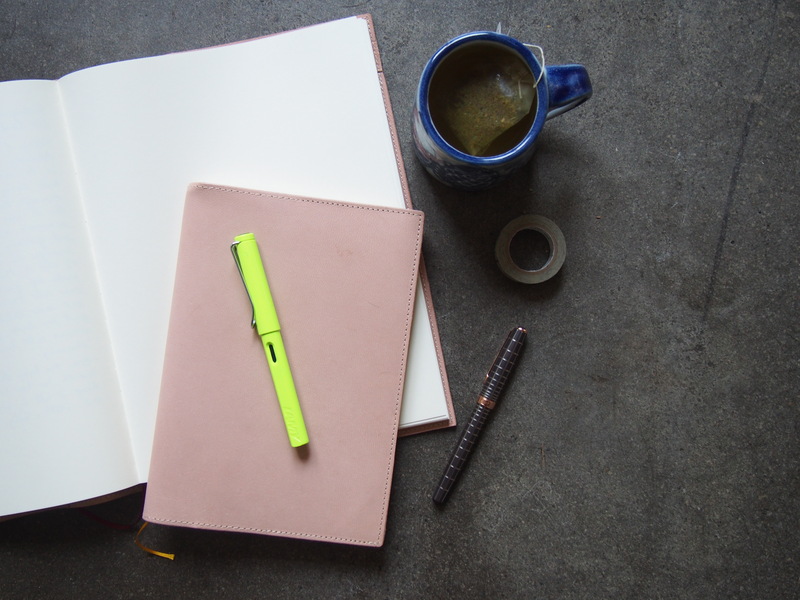 Midori makes some of the best fountain pen friendly paper out there, and best of all these MD Notebooks can be found all over the world, so you never have to worry about finding more refills no matter where you are. 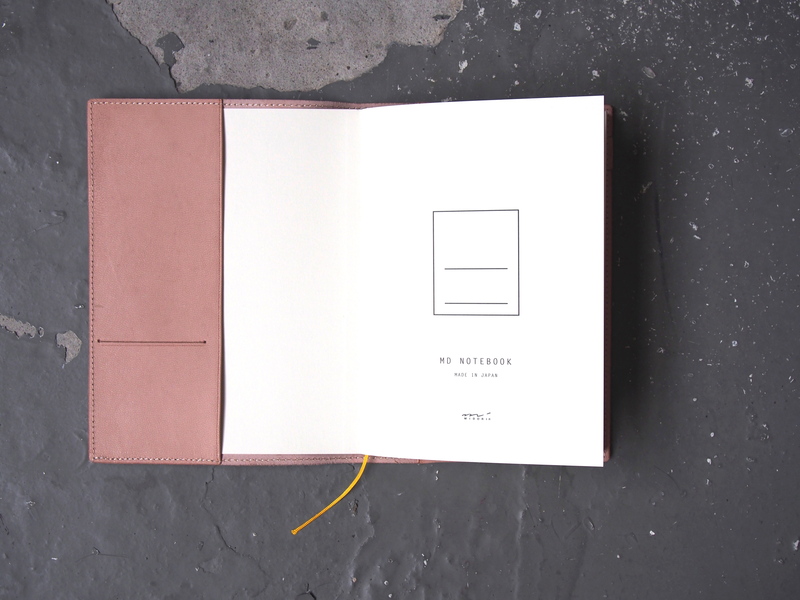 Having this gorgeous creamy white paper card stock as the cover of the notebook slipped into the exterior leather cover is kind of like this beautiful secret in your notebook. Along with all of your other actual secrets and brilliant ideas, of course. The covers come in A6, A5 and A4, and I’m most excited about the A4 because it’s so hard to find covers so large. On the inside of the front and the back of each size is a little cut out insert for you to put cards and other things. The back slot for the A4 cover is quite large, so you could put folded up papers and notes in there. The pen holder is not big enough for most fountain pens, as you can see here. It’s great for slim pens, pencils, gel pens, etc. If you look carefully you can see that there’s actually a cut out so if you’re not using the pen holder, it folds back flat almost flush with the back cover, and in fact looks like just a very discreet MD Logo in the leather. I now have both an A5 and an A4 cover. 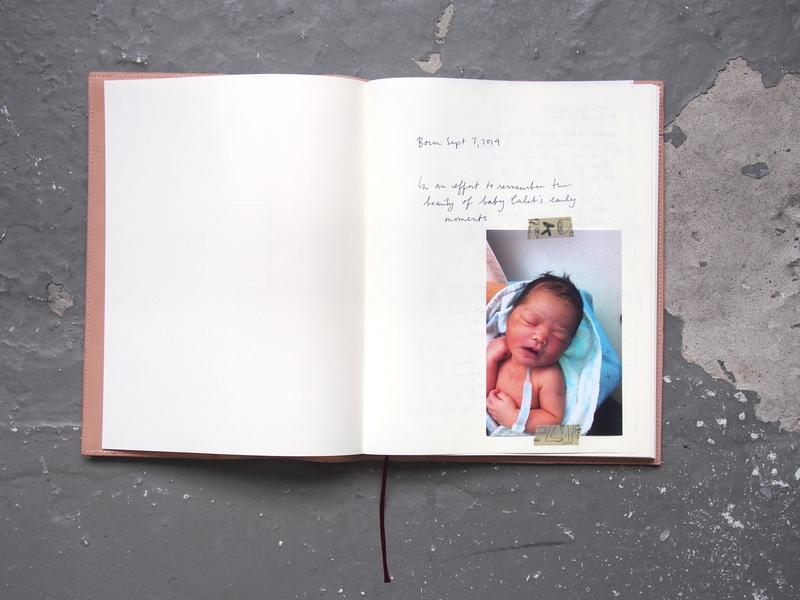 I’m waiting to finish my current journal to start the A5 notebook, which may be a painful few months ahead, but the A4 I’ve already starting using as a record of Caleb’s life. I had been meaning to do this for a while, but life and the shop and procrastination kind of got a hold of me. The arrival of these leather covers was the perfect opportunity to finally get around to it. I’ve been backtracking from last year, and I feel vaguely like I’m missing a few memories from Caleb’s earlier days, but I think it’s also because those early days were kind of a daze for me, and also he didn’t really do too much when he was basically this wiggly yet sleepy creature. You can see there are some long, wavy marks that are just noticeable, along the bottom right corner. These are natural imperfections, and I think they’re just going to smoothen and wear in with time. This is true goat skin leather, not “leatherette” or an artificial material, so it will come with natural blemishes and marks. The covers are fairly light to begin with, but the leather will darken and warm up over time, and mine, at least, will have a few more marks added. Needless to say, I cannot wait until this leather starts working in a bit and starts developing a patina – it will be great to compare it over time to this initial blog post when the covers were brand new. I’m a big advocate of buying high quality and beautiful goods and trusting them to serve you for a long time. Leather especially is this beautiful, rich, warm and luxurious material, but it’s also tough and durable, and I love that it will break in over time. My Superior Labor pen roll is already beginning to soften up with use, and I’ve had my leather satchel for years. One of the things that we really hope for with our shop is to try to offer some inspiration for you to write – handwriting your notes in the lecture hall to help stimulate those neurons in your brain, reflecting on your day in your journal, writing a letter to someone to tell them you’re thinking of them or to share a laugh. Really, I truly believe writing can be a way of experiencing life a little more deeply. We hope when you read the blog, you might find some spark to rediscover your inspiration, or that you can come into the shop and find useful and beautiful tools that are just what you need to start that first sentence. We’ve been searching a long time to find a leather notebook like this to keep you writing for years, and this is just that. Want. Love at first sight! Beautiful! How tight is the fit with one notebook in the cover? Do you think you could fit a passport in there as well at the same time? It’s a pretty snug fit, but I think there’s room for a little more. Do you mean to put the passport inside the flap, between the leather and the paper cover? There would definitely be room there. I think if you put more and more there, the leather would eventually stretch to accommodate, but not really bounce back over time. Hello! How resistant (or not) is this to stains? I bought the paper notebook cover from Midori, but I found that the stains and scuffs it got from being in my backpack really took away from it. Ah, the pains of being an illustrator and carrying your studio on your back. PS: I am making a trip out in December, and I can’t wait to stop by! Mine has seemed fairly resistant to stains relative to other leathers (it’s not super soft or suede-like), however, like all natural materials, it will pick up stains or scuffs the more you use it. I have always thought of that as “breaking in” the notebook and letting it show its journey, but I’m sure you could find oils or waxes to give it a bit more protection if you wanted. I think as well the more you use it, the more the leather will pick up the oils from your hands, which will help it repel other liquids, to a limited extent. these are lovely. i’m curious if you have a current picture showing how dark the leather has gotten.